Caffeine: Found in guarana, kola nut, tea, coffee and yerba mate. Paraxanthine: Interestingly enough, this xanthine has not been confirmed to exist in any plants. However, in humans it is one of the main metabolites of caffeine. It is stimulating like caffeine but reported to be better at enhancing wakefulness. Theobromine: Found in chocolate/cacao, tea, coffee and yerba mate. Theobromine is most commonly found in large concentrations in chocolate. Theobromine is stimulating like caffeine but much less potent. It also enhances blood flow by relaxing our blood vessels. Theophyline: Found in tea, chocolate/cacao and yerba mate. This xanthine is most commonly found in tea and can relax our bronchial smooth muscles in addition to our blood vessels. Like the other xanthines, it also has a stimulating effect. Theacrine (Teacrine): Which is present in small amounts, in a special kind of tea called kucha. Theacrine is unique, in that it lasts much longer than caffeine, appears to enhance mood more, and does not appear to build up as much of a tolerance as regular caffeine does. Anecdotally, the effects also appear to be smoother than caffeine. Methylliberine (Dynamine): Methylliberine is also found in small amounts in kucha tea. However, it is very different in comparison to theacrine. methylliberine kicks in very rapidly and the effects are also short lived. Anecdotally, it has more of an initial punch than theacrine and the other xanthines, while also being very smooth and providing a significant lift to our spirits. We could write an entire book on all of the xanthine molecules and the various fascinating effects they have. So, for this blog, we will be focusing solely on Dynamine methylliberine which in our opinion is one of the best xanthine derivatives available at the moment. Dynamine is Methylliberine, a purine alkaloid found in the kucha tea leaf. Its molecular structure is similar to another natural energy supplement known as theacrine (aka TeaCrine) and is believed to behave in similar ways in the body. Like Theacrine, methylliberine may amplify feelings of energy, mood and focus by activating dopamine receptors and other key neurotransmitters, and inhibiting adenosine receptors. We first came across Dynamine methylliberine when our sister brand Natrium Health was in the initial stages of Dynamax research and development. The idea behind Dynamax was to create one of the best and most comprehensive caffeine and l theanine based products we could come up with. We got our hands on a collection of very interesting xanthines, xanthine derivatives, and xanthine formulations. We got the initial stack together, yet we felt like it was missing some punch. 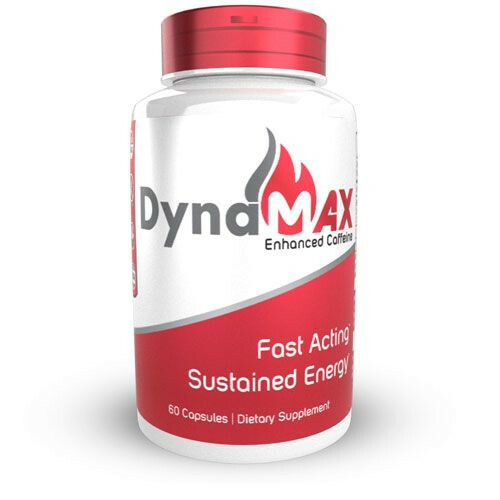 That is until we added just 100 mg of Dynamine to the mix and it surprised a lot of us who were beta-testing Dynamax. The Dynamine kicked things up quite a few notches and the effects were noticeable within about 15 minutes. We were so pleased with it, in fact, that we fast tracked development for this product and came out with it way ahead of schedule. Dynamine methylliberine taken by itself is an interesting experience, yet it can also be somewhat lackluster, depending on what you are looking for. As a late-night pre-workout, Dynamine is fantastic because the effects are short lived. Thus, after a long day of work, when energy and motivation levels are low, a Dynamine dosage of 100mg can help perk us up without interfering with sleep. Used this way, a Dynamine dosage of 100mg provides a subtle lift in energy levels whereas a Dynamine dosage of 200mg really gets things going. That being said, the stimulation that Dynamine methylliberine provides is not as pushy as caffeine, which is why for some individuals (especially for those whom are frequent caffeine users) Dynamine methylliberine may be somewhat lackluster. Here is where Dynamine methylliberine can really shine and this likely has a lot to do with its pharmacological profile. Most xanthine molecules produce stimulating effects by blocking adenosine receptors. Adenosine is a major neurotransmitter which is formed as a byproduct of various energy intensive processes throughout the body. Almost all processes in the body are powered by one primary energy molecule called Adenosine Triphosphate (ATP). When ATP gets used to generate energy, a phosphate group falls off. This then generates Adenosine Diphosphate (ADP). ADP can interact with more phosphate groups to regenerate ATP or it can lose another phosphate group, which will then generate Adenosine Monophosphate (AMP). As you may have guessed at this point, AMP can also interact with phosphate groups to regenerate ADP (which can then generate ATP), or it can lose yet another phosphate group, at which point we are left with plain adenosine. Adenosine can also be created by the direct breakdown of ATP in the brain by enzymes called ectonucleotidases. It also appears that oxidative stress and inflammation can speed up the generation of adenosine. This free adenosine can then start to bind to adenosine receptors in the brain, which will gradually cause significant lethargy, making it very hard to stay awake. This is fantastic if it happens at night before bed. All of the energy we exerted throughout the day that has slowly led to a massive buildup of adenosine is now helping us fall asleep. During sleep, a lot of this adenosine gets broken down and we wake up feeling refreshed. However, adenosine can start to affect us far before sleep. This is why, when xanthines block adenosine receptors, we start feeling more awake and alert. Adenosine receptors also control the function of many other receptors throughout the brain such as dopamine, norepinephrine, and serotonin. By activating adenosine receptors, the activity of these receptors decreases, whereas blocking adenosine receptors, can increase the activity of these receptors. Ok, so we went a little bit off track there, but that is because the adenosine system is a very fascinating and complex system! Now to get back to the nitty gritty: what does methylliberine do differently? Methylliberine, instead of blocking adenosine receptors, appears to act as a negative allosteric modulator. This means that methylliberine, instead of producing effects by fully blocking adenosine receptors, produces its effects by decreasing the overall sensitivity of adenosine receptors. This ultimately means that more adenosine needs to bind to adenosine receptors, in order to make us tired. Negative allosteric modulators also tend to produce a less sharp tolerance buildup which is likely why Theacrine (which also appears to be a negative allosteric modulator) and methylliberine appear to build up tolerance much less quickly than caffeine, which fully blocks adenosine receptors. What this also means is that it can quite substantially boost the effects of caffeine by allowing a smaller amount of caffeine to produce a blocking effect on adenosine receptors. This is fantastic for individuals looking to boost the effects of caffeine without having to actually take more caffeine. This was one of the main benefits methylliberine had on Natrium Health's Dynamax stack, as it appeared to significantly boost the effects of the caffeine portion of Dynamax without increasing jitteriness. Since the majority of xanthines are adenosine receptor blockers, methylliberine can help enhance their effects too. Consider stacking Dynamine with Chocamine Cocoa Extract (high in theobromine) for a smooth, gentle, but effective pre-workout. Combine a Dynamine dosage of 100mg with a cup of green tea, to enhance the energy increasing effects of the xanthine profile in tea. If you are feeling very adventurous, Dynamine methylliberine may even help elevate yerba mate tea (which has a very comprehensive xanthine profile) to a very comprehensive and smooth stimulating brew! Of course, given our previous mention of the success of combining caffeine and methylliberine, it is no surprise that a Dynamine dosage of 100mg may also give your morning cup of coffee a much bigger punch. What Makes Dynamine Methylliberine Different from Teacrine? Theacrine also goes fantastically with methylliberine. In fact, the makers of Dynamine and Teacrine, Compound Solutions, are big advocates of combining the two. 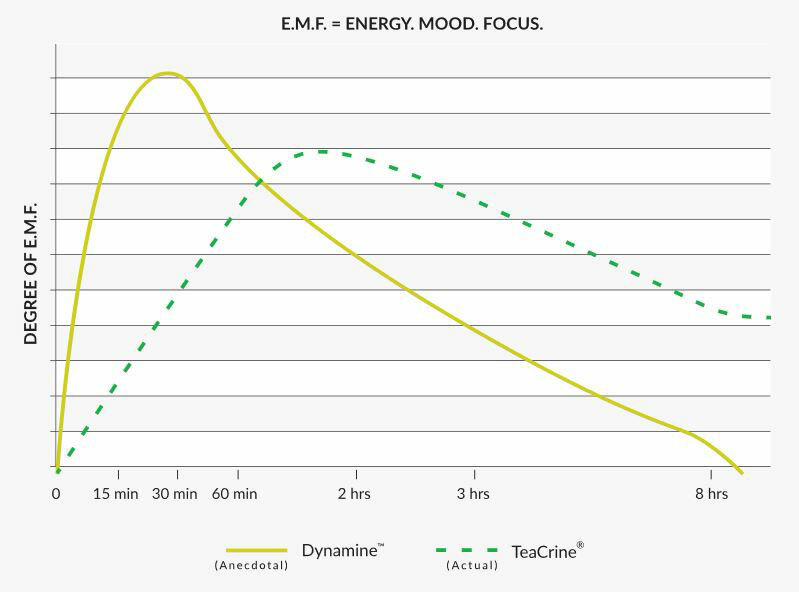 According to Compound Solutions, the combination of Teacrine and Dynamine will lead to a rapid onset of effects (due to the Dynamine) which is then complimented by the long-lasting effects of Teacrine. ●Dynamine with Chocamine Proprietary Cocoa Extract: As mentioned earlier, this should help boost the stimulating effects of theobromine, whilst increasing blood flow, enhancing focus and mood, without being too stimulating. To us, this sounds like the perfect combination for a long run out in nature or a demanding yoga session. 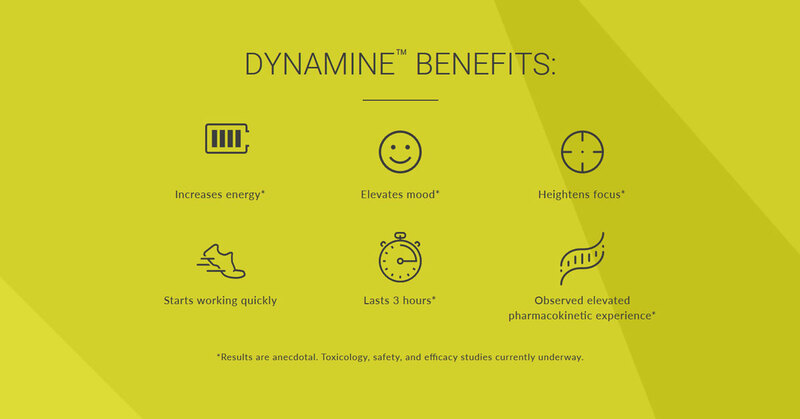 ●Dynamine with Caffeine with L Theanine: If you want to get a taste of what Dynamax can do, but you are not ready for 8 hours of energy, then the combination of Dynamine with our original Caffeine with L Theanine capsules would be ideal. Some customers have mentioned that our original formula of Caffeine with L Theanine was not stimulating enough. This is why we flipped our ratios to 200mg Caffeine and 100mg L Theanine in our new Caffeine with L Theanine capsules. However, if you do not want to increase your caffeine intake, then a Dynamine dosage of 100mg will help significantly ramp up the effects of our original formulation of caffeine with L-theanine. ●Dynamine with Caffeine + N-Acetyl L-Tyrosine solution: For those looking for some seriously focused stimulation, we would recommend combining a dynamine dosage of 100mg with a dose of caffeine/NALT solution. The combination of caffeine, with NALT, already helps elevate the focus enhancing benefits of caffeine. Combining the caffeine/NALT solution with dynamine really helps dial in the focus even more and may help enhance our ability to focus on hard and demanding work. This would also make for a simple but highly effective pre-workout. This All Sounds Great, But Why Is There So Little Information Available About Dynamine Methylliberine? As you may have noticed, beyond this blog and a select few other blogs available on the internet, there is not a whole lot of information to be found on Dynamine methylliberine. This is because it is a very new ingredient that up until very recently had not been extracted and produced in meaningful amounts. Through some serious innovation on behalf of Compound Solutions, we now have access to this cutting-edge xanthine derivative. Compound Solutions is currently running controlled studies on Dynamine methylliberine in order to understand methylliberine on a deeper level. We are also actively working on bettering our understanding of this unique energy booster - especially determining beneficial combinations of methylliberine and various other novel natural ingredients. You may see some of this information pop up in the future on both Nootropics Depot and Natrium Health. In the meantime, we will keep researching and we will post an update once there is a larger pool of information available to us! In the meantime, we will leave you with a recipe for a highly effective pre-workout that includes Dynamine methylliberine as this seems to currently be one of the preferred uses for Dynamine! Citrulline DL Malate: A dosage of 3-6 grams, will provide nitric oxide boosting effects. Nitric oxide will help enhance blood flow, which may increase endurance and muscle growth. Creatine Monohydrate: A dosage of 5 grams. Creatine is best taken long term to enhance strength as can be read in our creatine blog here (blog link). However, creatine monohydrate may also help enhance hydration prior to workouts and may help generate ATP. CoQ10: A dosage of 200mg. CoQ10 goes hand in hand with creatine to help enhance ATP production. CoQ10 may also help boost energy levels. Cordyceps 10:1: A dosage of 250mg. Cordyceps will help enhance endurance, whilst also providing a solid mood lift and uptick in endurance. Dynamine: A dosage of 100mg. Caffeine with L-Theanine: One capsule of our original formula that contains 100mg of Caffeine and 200mg of L Theanine. Due to the Dynamine methylliberine, this pre-workout blend will kick in fast and with the addition of CoQ10, Cordyceps 10:1 and Caffeine with L-Theanine, will carry you through long workouts. The Creatine (especially if supplemented outside of this blend on a daily basis) and Citrulline DL Malate will help enhance strength and endurance. This is a simple, no-frills pre-workout that simply works. Give it a shot and let us know what you think!